A group of scientists have found what may be the most intact fossilized primate skull ever discovered, and the find could shed light on the common evolutionary heritage shared by apes and humans. The lemon-sized skull was discovered in Kenya by an international team of researchers, and was dated to the middle of the Miocene era, a little-understood time when many species of ape arose in Africa, including common ancestors of both modern apes and humans. 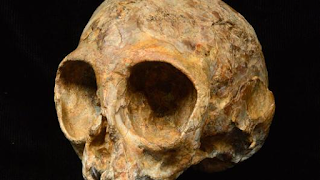 This skull could give scientists insights into what those common ancestors looked like. The team reported its findings Wednesday in the journal Nature. The fossil, belonging to the newly named species Nyanzapithecus alesi, bears some resemblance to those of modern-day gibbons, and possesses features that would only be found in apes, such as ape-like teeth. However, certain features distinguish it from modern gibbons, suggesting it was a very different type of animal. The numbers sre conclusive...this EXTREMELY RARE Skull is a Hoax....If anything lived 13 million or more years then they should be buried under 13 million years of rocks and uncovering these rare skulls is a by-product of deception and forgery.